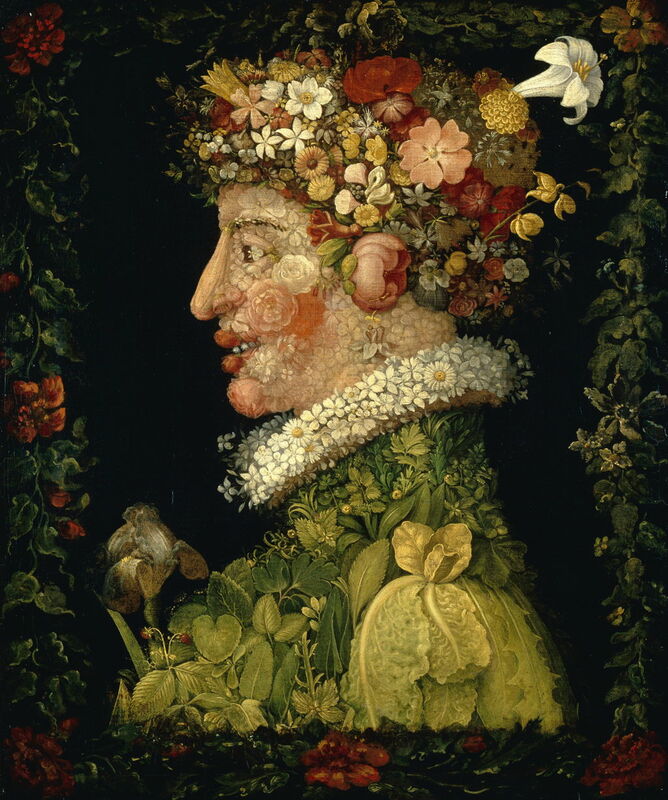 Giuseppe Arcimboldo (1526/7–1593), Spring (1573), oil on canvas, 76 x 64 cm, Musée du Louvre, Paris. Wikimedia Commons. 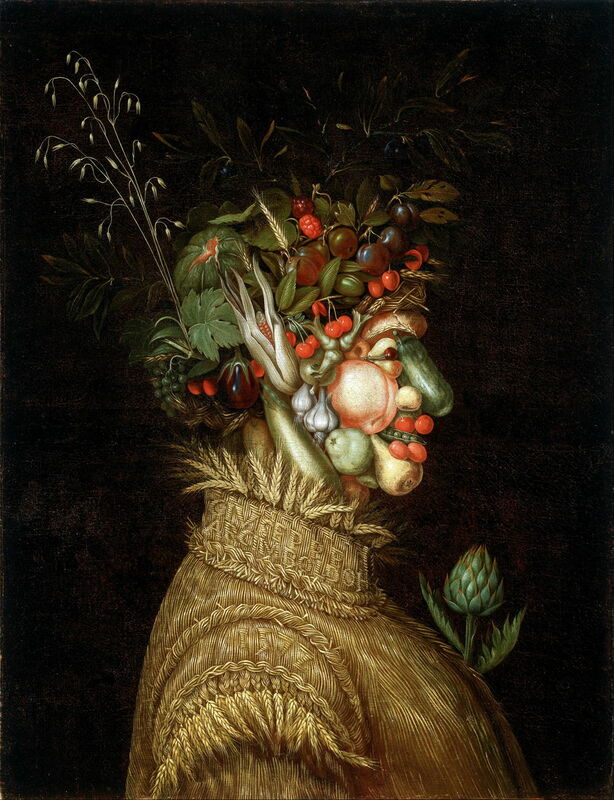 Giuseppe Arcimboldo (1526/7–1593, also sometimes known as Arcimboldi) might have been just another of the thousands of Mannerist painters who satisfied the need for portraits, religious works, and the like. But some time in his mid-career he started to produce portraits which were unique, and even today have not been matched. For instead of building his portraits in the normal way, using paint to imitate his perception of the form of the subject, his portraits were assembled from his painted representations of other objects and creatures – books, plants, flowers, birds, even the barrels of cannon. No one seems to be sure exactly when this started to happen, nor why he did it, to begin with, but he probably painted his first when working as the court portraitist to the Habsburg court in Vienna, in the 1560s. It might have begun as a joke or whimsy, and some considered that all these paintings were only ever whimsies or capriccios. But he discovered that they were more popular and successful than his normal portraits and other works. 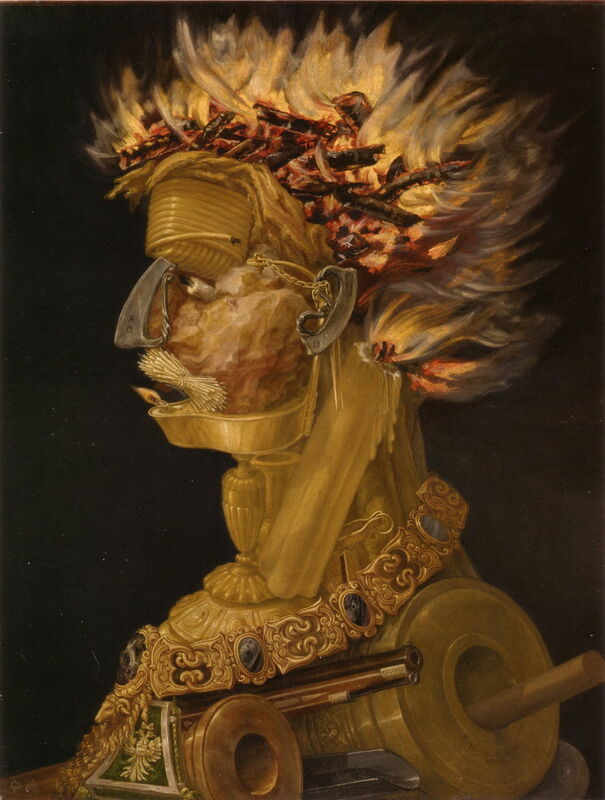 Giuseppe Arcimboldo (1526/7–1593), Fire (1566), oil on panel, 66.5 x 50.8 cm, Kunsthistorisches Museum, Vienna. Wikimedia Commons. His first significant group of these paintings showed the four classical elements, including Fire (1566). At this stage, these paintings were made from carefully chosen and positioned objects which are associated with the theme of the work. So this uses a bundle of matchsticks, steels used to make sparks, burning logs, and firearms. Giuseppe Arcimboldo (1526/7–1593), The Four Elements, Air, Earth, Fire, Water (1566), various details. Wikimedia Commons. His series The Four Elements used creatures predominantly as its building blocks: Air consisted of birds, Earth of land animals, Fire of inanimate objects, and Water of fish and aquatic creatures. 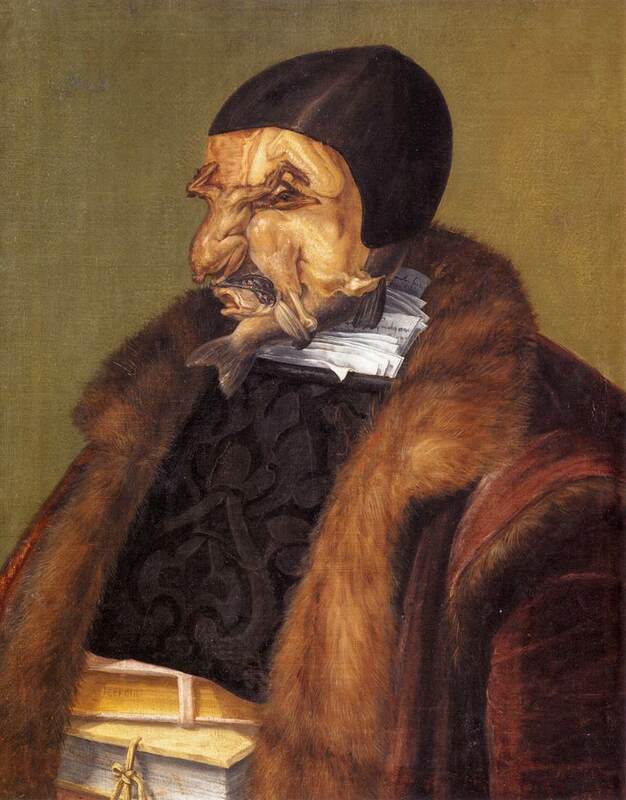 Giuseppe Arcimboldo (1526/7–1593), The Jurist (1566), oil on canvas, 64 x 51 cm, Gripsholm Castle, Mariefred, Sweden. Wikimedia Commons. He quickly discovered that careful choice of building blocks could also convey a second message, for instance turning the portrait into satire. In his The Jurist (1566), for example, he used edible meats to compose the face, legal papers for the upper body, and books for the torso. 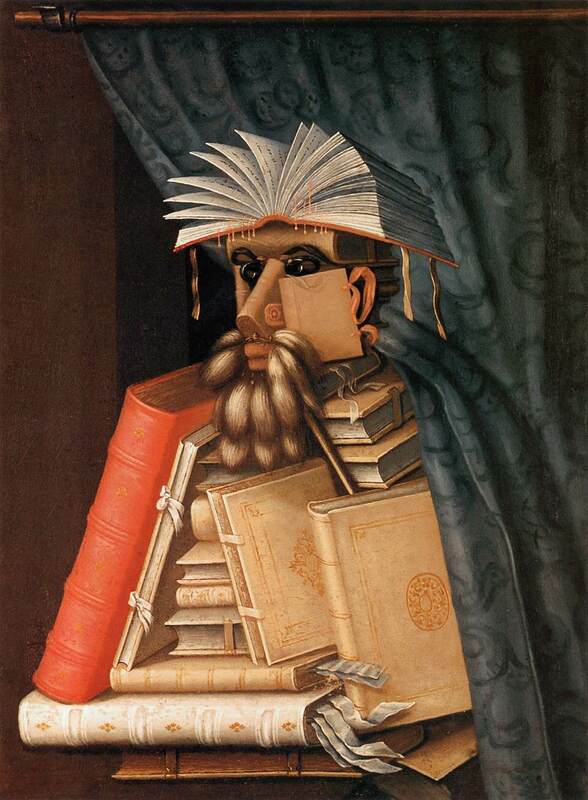 Giuseppe Arcimboldo (1526/7–1593), The Librarian (c 1570), oil on canvas, 97 × 71 cm, Skokloster Castle, Håbo, Sweden. Wikimedia Commons. Earlier paintings tended to use larger objects, as in his The Librarian (c 1570), which made the portrait appear less real; the animal tails shown were used as book dusters at the time. However, on the strength of these successes, Augustus, the Elector of Saxony, commissioned him to paint a series depicting the four seasons, and these were perhaps the height of his achievement. Giuseppe Arcimboldo (1526/7–1593), Summer (1572), oil on canvas, 92 x 71 cm, Denver Art Museum, Denver, CO. Wikimedia Commons. 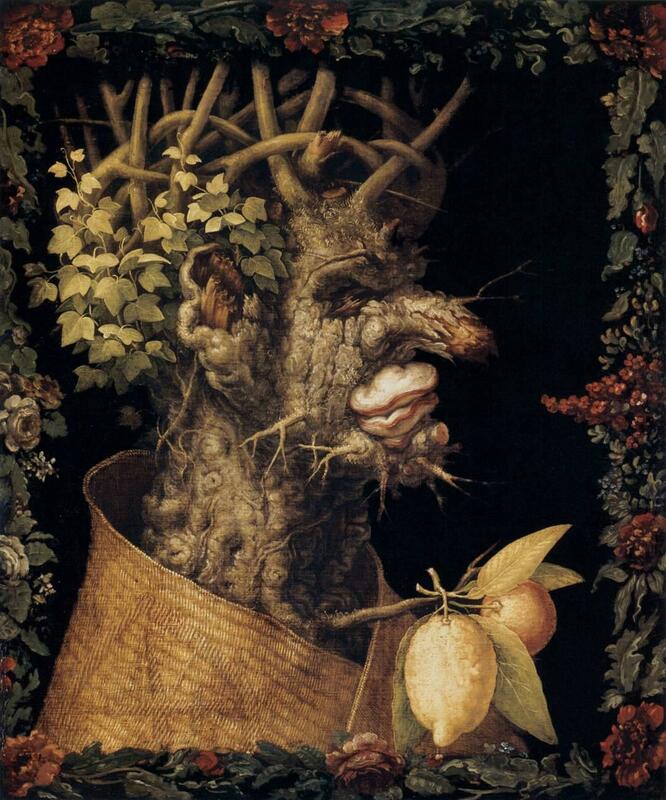 Giuseppe Arcimboldo (1526/7–1593), Autumn (1573), oil on canvas, 76 x 64 cm, Musée du Louvre, Paris. Wikimedia Commons. Giuseppe Arcimboldo (1526/7–1593), Winter (1573), oil on canvas, 76 x 63.5 cm, Musée du Louvre, Paris. Wikimedia Commons. The complete set of four are currently in the Louvre in Paris, and well worth a few minutes of your time when you next get a chance to look at them. Giuseppe Arcimboldo (1526/7–1593), Reversible Head with Basket of Fruit (c 1590), oil on panel, 56 x 42 cm, Private collection. Wikimedia Commons. Late in his career Arcimboldo experimented with optical illusions, creating works which appeared to be a still life when viewed the ‘normal’ way up, but when the painting is inverted, the image instead showed a portrait composed of the fruit, vegetables, and other objects which were in the still life. 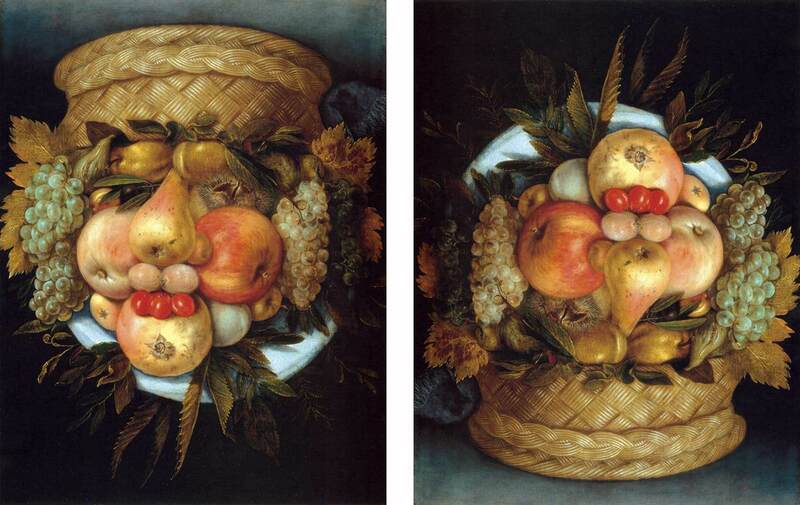 His Reversible Head with Basket of Fruit (c 1590) is a good example. 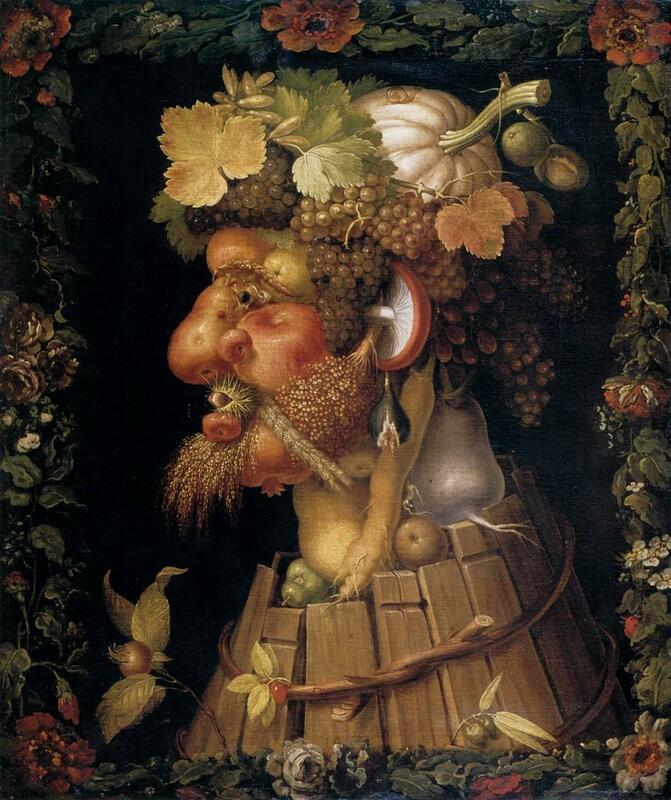 Arcimboldo’s paintings are fun, and excellent works for children who are just being introduced to art. But there is more to them as well. Representational art is about assembling marks and objects to create meaning in the whole. Normally those constituent marks contain little or no meaning of their own. 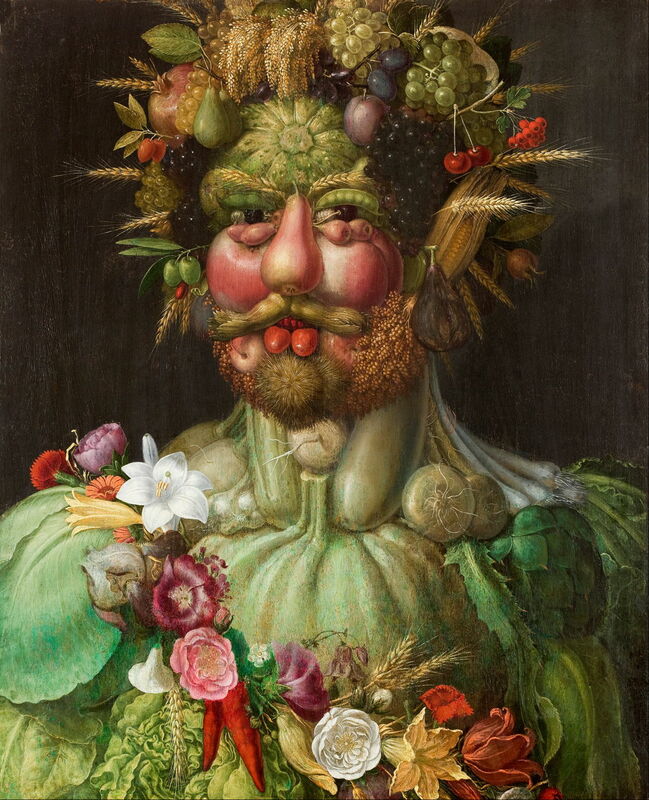 In Arcimboldo’s paintings, he has imposed another level of structure: the brushstrokes are assembled into the building blocks (flowers, fruit, etc. ), from which he then assembles the whole painting (typically a portrait). This additional level allows him to communicate an additional layer of meaning. In his satires, the meanings can be wittily contradictory, for example. Others have suggested that his paintings were an early antecedent to Surrealism, which can of course result from contradictions in layers of meaning. I would also suggest that they anticipated the collage medium, which is conventionally attributed to the twentieth century. Many collages have built similar layers of meaning by the choice of elements and how they are assembled into the whole. There have also been the inevitable claims that Arcimboldo’s paintings were a precursor to abstract art. Given the dense realism in the objects used to compose each image, and the layer structure, I think that is profoundly contradictory. Giuseppe Arcimboldo (1526/7–1593), Rudolf II of Hamsburg or Vertumnus (1590), oil on panel, 68 x 56 cm, Skokloster Castle, Håbo, Sweden. Wikimedia Commons. Posted in General, Life, Painting and tagged Arcimboldo, collage, gesture, mark-making, Surrealism. Bookmark the permalink. Interesting post with lots of pictures. That’s nice. Just the first picture with the text box on it is a bit annoying. The initial picture is a quirk, unfortunately, of the system: the image preview (required for Facebook, Twitter, et al.) does not always work well on the article itself. However, if I do not place that preview, those media usually will not have an attached image. If anyone knows of a better solution, which will provide a chosen image for social media announcements but not cause problems on the article, I would love to know of it, please.